Keshawn Spence is a Senior Chief in the United States Navy and a graduate of the Senior Enlisted Academy. He attended Saint Leo University and graduated with a Bachelor's Degree in Criminal Justice and a Master of Business Administration (MBA) Degree with a concentration in Human Resources Administration. After growing up without a stable household and absent parents, he was able to embark on a successful Navy career and rise to the rank of Senior Chief. He and his wife have 3 children. Bound By My Choices is an illustrated revelation of his personal stories of trials and tribulations, failed parenting, and ultimate success and redemption. This book will prove that no matter what situations you are born into, you can change the course of your life. This book will appeal to anyone who aspires to overcome adversity. 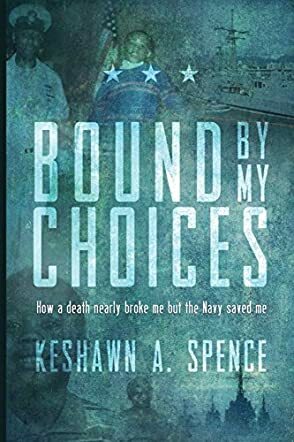 Bound by My Choices: How a Death Nearly Broke Me But the Navy Saved Me is a memoir written by Keshawn A. Spence. Born to a dysfunctional family, Keshawn is raised by his paternal grandmother, Evelyn, in Ironshire, a small backwoods on the eastern shore of Maryland. With an alcoholic father and a mentally unstable mother, the young boy does not have a normal childhood but he formed a very strong bond with his grandmother and his Aunt Thelma, who lived nearby. When his grandmother died, his world collapsed around him and his future seemed very bleak. Life was becoming mostly bitter, sometimes sweet, and after finishing high school, he made a choice that would put him on a path that nobody, including himself, ever expected. Keshawn A. Spence's revealing memoir, Bound by My Choices, is a beautifully illustrated and well written story. The author's candor and sincerity are definitely appealing but it is his determination to make something out of himself that makes this book very special. Bound by My Choices is a man's journey through a life plagued by failed parenting, trials, tribulations and the death of a loved one. But most of all, it is a story of redemption and success in a place where many people least expect it. And, as such, this book should serve as an inspiration to all because life is always not an easy journey but, in the end, life is really what we make out of it.